Everyone is familiar with tarot cards as a method of divination, but far fewer are aware of the Nordic system of runes. Far older than the tarot, they offer a different point of view on many situations, and can provide valuable insight that the tarot may not offer. 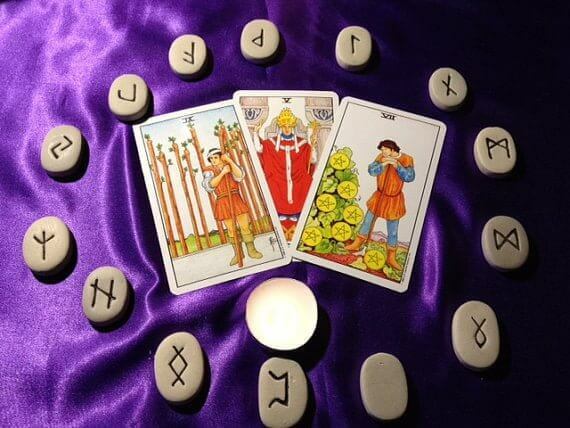 Reading runes is different from reading tarot, but there are many similar aspects in the methods of both. There are still spreads used in runes, though they tend to consist of fewer points to the shape. There are still reversed and upright readings, though in the runes, there are several that cannot be reversed because they are the same in either direction. Each rune has a specific meaning, but unlike the tarot, they have less room for interpretation. The runes are drawn at random, like the tarot, but as the runes are generally carved into wood or stone, the method of drawing is different. To start a rune reading, first lay down a cloth or handkerchief on your reading surface. It is important to protect the surface from the hard material of the runes, and also to protect the runes themselves from whatever could be on the surface like dust or sand. Sit across from the querent, just like a tarot reading. Listen to the matter that the querent asks, and then decide which spread to use for the reading. Instead of letting the querent shuffle the cards, let them shake the bag in which your runes are kept to mix them well. Then, one by one, tumble out runes from the bag without touching them until your have the proper number of runes. Place them in their places in the spread, maintaining their orientations and turning all of them face-up if they fell face-down. You can now begin to interpret the runes as they lay, following much of the same methods as the reading of a tarot spread, but remember that the runes are much more cut-and-dry than the tarot. The tarot are flexible, malleable in their meanings, where the runes are solid and unchanging, as reflected in their being set in wood or stone. The unique thing about runes is that they have a tendency to link together. If a certain rune is unclear or requires more explanation in the reading, you can tumble a second rune out and add it to that rune, and interpret them together.